What will best prepare me to start the program? Be ready to learn! Realize that high-level and exacting instruction should NOT be taken as a negative, or as criticism. Apprentices are being paid to be educated; therefore there is a high level expected of performance and continuing improvement. You should be able to recognize stress as a tool, and thrive in a fast paced and ever-changing environment. If you can understand and adopt a mindset of perfection and attention to detail, you will do well in the program. Will there be class time? The Apprenticeship is truly on-the-job training. From day one, Apprentices are a productive employee on a specific build. While there are some classes required outside of a normal work day, upon completion of the program there will be additional opportunity to take specialty courses for industry certifications. From time to time, Apprentices may be asked to read a book specific to improvement of a current skill, or to gain understanding of company cultural development. Will I get credit for attendance at a boat school? Van Dam Custom Boats builds with methods not widely taught, and at an expert level – and while boat school attendance is viewed as extremely valuable – Apprentices will need to prepare for a very different emphasis in skill and processes. Van Dam will move you immediately to a more intense level of learning, skill and expectation than you experienced in school. Success in our Apprenticeship will lie in mastering clearly defined skill sets. Credit will be given for the number of hours completed through previous schooling and additional “Credit”, in the form of completed skill sets, will be awarded based on assessed ability and aptitude. The Apprentice will drive that process. Why is the program completion rate low? As outlined in previous questions, you will be expected to excel in an intense, fast-paced, and ever- changing environment. An Apprentice will immediately be working on important client commissions, and their daily actions will directly affect the outcome of the entire project. Apprentices are expected to be proactive and attentive learners, and will need to project that in their daily efforts. Every task in the shop is important from sweeping the shop floor, to molding wood, to weeks of sanding and varnish. Repetition is a normal part of the building process, and an Apprentice may have days where the reward of the long-game is lost, and the glamour and excitement of the build escapes them. These times define our character. We want to be as up front as possible regarding challenges of the position and what will be expected from an Apprentice accepted to the program. Understand that not every successful college athlete makes it to the professional level. We are the best in the world at what we do, and we expect nothing less from those who are asked to join us. It is traditionally a 4-year apprenticeship; however, depending on the aptitude, attitude and learning ability of a candidate, it can take less or more time. If asked to join us, you will be given an Apprentice Packet that outlines the expectations of the program and provides check lists containing skills and accomplishments that must be evaluated and approved, before moving on to the next stage. You are in the driver’s seat in terms of how quickly you will work your way through the program. How will I know if I am doing well? Apprentices can expect continual direction and instruction with the expectation that you will succeed. There will be periodic reviews, and depending on many factors determining your performance, there may also be wage increases. 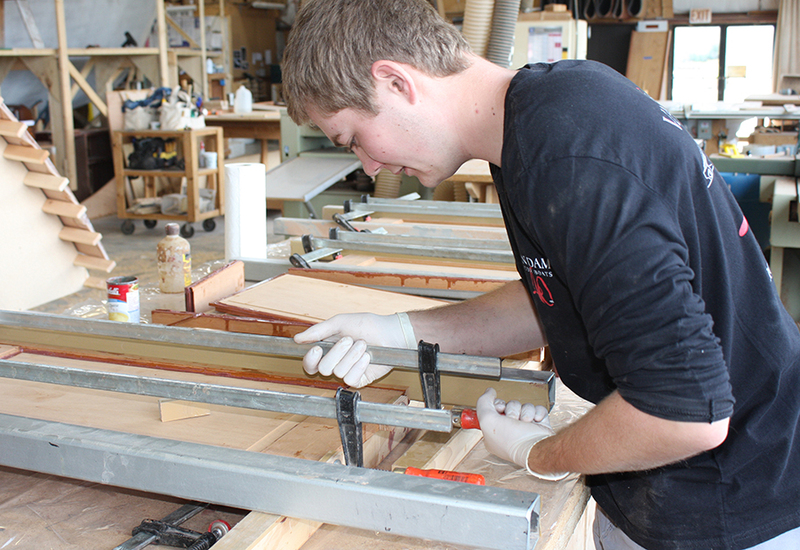 It is important to understand that Van Dam Custom Boats is dedicated to the success of our Apprentices. We are fully invested in helping all employees become their best, and we promise to “have your back” throughout this sometimes difficult learning process. What is a normal week of work? Apprentices will be part of a select group of elite craftsmen building “Bugatti level”, “one of one” creations. Our brand of normal is far above others in our industry or beyond. Depending on the timing of a committed launch, work weeks can range from 40 to 60+ hours, 5 to 7 days a week. Each day presents expected, and sometimes very unexpected tasks. On any given day Apprentices and craftsmen alike are prepared to work alone or to gather shoulder-to-shoulder to problem solve or handle a large load. Everyone in the shop is expected to support not only the project at hand, but each other in the pursuit of excellence, whatever shape that may take.